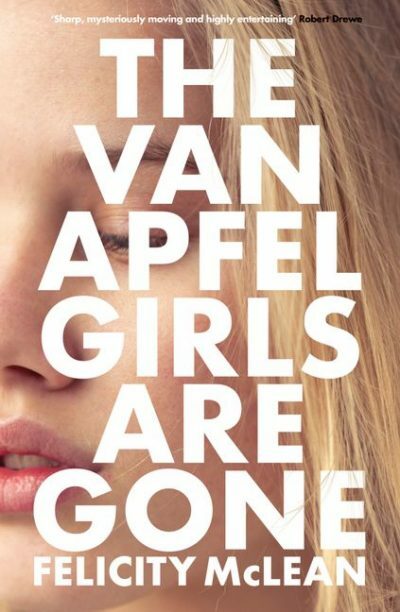 Felicity McLean’s debut novel The Van Apfel Girls are Gone opens with the arrival of a ghost, ‘summoned by the death rattle of Cornflakes in their box’. It is an apt beginning, for this is a novel haunted by trauma, death and the disappearance of three young girls. It is 1992 and, somewhere in suburban Australia, eleven-year-old Tikka Molloy and her older sister Laura divide their time between school and the Van Apfel family’s swimming pool. Tikka is in thrall to the eldest Van Apfel girls, Hannah and Cordelia. For readers who were captivated by the Lisbons in Eugenides’ The Virgin Suicides or Miranda in Lindsay’s Picnic at Hanging Rock, these girls are similarly mythologised as ethereal queens of their small domain. But behind closed doors, they are ruled by their violent, fanatical father. When the Van Apfel sisters disappear in local bushland, Tikka suffers a trauma from which she, and the entire neighbourhood, never fully recover. Returning home 20 years later, Tikka and her sister are forced to confront the past. McLean expertly maintains an air of suspense as the tragedy unfolds. Tikka is an unforgettable, if not entirely reliable, narrator full of black humour, brutal honesty and naive curiosity. This novel is one that will haunt readers long after they have turned the last page.